Karnataka, Apr 09: Addressing the second rally on Tuesday in Karnataka's Chitradurga, Prime Minister Narendra described Karnataka as strong stood state with BJP among other states. Lashing out at Congress-JD(S) alliance in Karnataka, Modi said the two parties came together for the sake of the power. 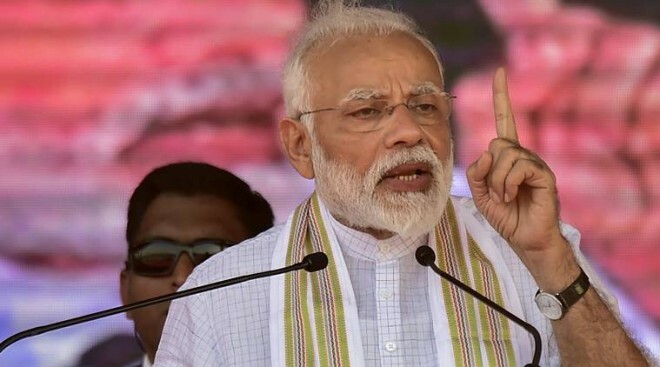 Earlier PM Modi was addressing a poll rally in Maharashtra’s Latur, on Tuesday said that BJP government has ensured that terrorists are identified and killed, even if we have to enter other countries to do so. "To kill terrorists right in their dens is policy of New India," he said. Attacking Opposition, PM Modi said, "Congress is responsible for creation of Pakistan. Congress’s manifesto and Pakistan speak same language on Kashmir related issues. Had pre-Independence Congress leaders acted wisely, 'this Pakistan' would not have been created." "Even a child would know what happen to the second pilot," he added. "We didn't talk of air strike in manifesto, but carried it out when warranted," PM Modi added. ''They say chowkidar chor hai; but from whom are note bundles seized," Modi targets Congress. "Your trust is my biggest accomplishment in last five years," Modi told the crowd. He also said his objective is to rid India of naxal and Maoist menace.